What are you up to this weekend? We had a busy week of pool time, an IKEA trip, play dates with cousins, park fun, fixing up things around the house, and more. I might just relax a little bit this weekend, and try to catch up with laundry. Thanks for the link up party Amanda! Hi, Amanda! 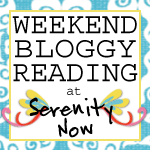 Thank you so much for letting me come and join your wonderful "Weekend Bloggy Reading Party"! I appreciate you hosting & am anxious to look @ all the great Inspirations you have here! I hope you are enjoying a wonderful weekend! Thank you so much for hosting this Link-up! I am new to link parties and appreciate the opportunity to share!